Ginger, my favorite spice. It has a certain delicious aroma and has the warming effects when you drink it as a ginger tea or wedang jahe in Indonesian, one of the remarkable features of this spice. But that’s not all, ginger health benefits is beyond description. It has been used for medicine and herbs over 5000 years in Asia, India and Arabic land. Ginger is a knotted, thick and has the beige color. It is a rhizome, underground stem that has structures to enlarge the nutrient store. Ginger is a good source of potassium, magnesium, copper, manganese and vitamin B6. The most important components of ginger are gingerols and shogaols. Gingerols is relative of capsaicin, the component that gives the spicy taste. 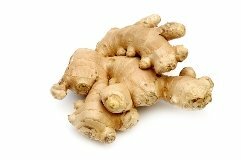 When ginger has been cooked, the gingerol transform into zingerone, which has a spicy sweet aroma. So this character of ginger that makes it so popular as a drink or other dessert component. Shogaol name is derived from Japanese name of ginger. Shogaols are artifacts formed during storage or through excess body heat, probably created a dehydration reaction of the gingerols. This warming effects of ginger make it the perfect remedy for colds, fever, diarrhea, stomach upset, nausea, aid digestion, colic, arthritis treatment, headaches, painful menstrual periods. Ginger can also be used to treat disease that caused by inflammation such as arthritis or ulcerative colitis. Use fresh ginger instead powdered or dried form, It’s not only taste better, it has also has the high content of gingerol. You can easily obtain fresh ginger in the supermarket. It’s widely available. But look carefully before you buy them. Fresh ginger is firm, smooth and fee of mold and the flesh has fresh yellow color, while the mature ginger has a tough skin and the flesh has white grey color. You can easily keep ginger fresh for months by freezing it. Slice the ginger off, left unpeeled, into small slices before you freeze them so you can easily pick some of them out when you need them. Ginger is not only the perfect remedy for health; it’s also the perfect herb for culinary use. It’s great to use ginger for dishes and dessert. It makes the taste tastier and it help reduce the fishy smell of chicken and fish. We have a few dessert use ginger as a component, such as wedang jahe, kembang tahu (Flower tofu), mung bean desserts and a lot of dishes use ginger as an herb.